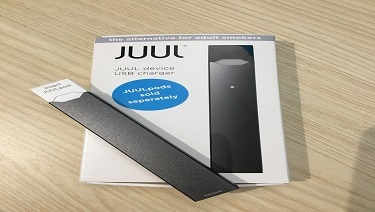 JUUL (pronounced “jewel”) is a brand of e-cigarette made by JUUL Labs Inc. The devices have become very popular in recent years, especially among young people. Using a JUUL, also called “Juuling,” can put kids’ health at risk in several ways. How is JUUL different from other e-cigarettes? JUULs do not look at all like other e-cigarettes. Small and sleek, a JUUL looks a lot like a computer flash drive. This makes it tricky for adults to recognize them right away as vaping tools. JUUL devices are easy to hide in a fist or a pocket. They can even be plugged into a laptop’s USB slot to recharge. How does a JUUL work? JUUL devices are battery operated and work by heating a pod of e-liquid or “juice” that contains nicotine, flavorings and other chemicals. When heated, the liquid creates an aerosol or vapor that users inhale. Why should parents be concerned about JUULing? JUUL comes in flavors that appeal to kids. JUUL “juice” pods come in mango, cool mint, fruit medley and other flavors. For many years, tobacco companies have used candy-like flavors to attract young people to smoke. According to Centers for Disease Control and Prevention (CDC) research, middle and high-school students say that flavor is a big reason they use e-cigarettes. JUUL is highly addictive. The concentration of nicotine in JUUL is more than twice the amount found in other e-cigarettes. Nicotine is the chemical that causes addiction. These high amounts are a serious concern for youth, who are already more likely than adults to become addicted to nicotine. The chance of addiction is so high that the U.S. Surgeon General has warned that the use of nicotine by youth in any form is unsafe. JUULing raises the risk of becoming a regular cigarette smoker. Research shows that young people who use e-cigarettes are more likely to begin using traditional tobacco cigarettes. JUUL use is common in schools and college campuses. Teachers report that students are using JUULs in classrooms, hallways, and school restrooms. They also share the devices with friends. This kind of social use encourages kids who don’t smoke to try JUULing. It also lets students who are too young to buy JUUL legally, or who could not otherwise afford them, use them through classmates. The AAP is particularly concerned about the threats to child and adolescent health posed by JUUL, including heightened risk of nicotine-dependence and other health concerns related to vaping. The AAP has joined with other organizations to urge the Federal Drug Administration (FDA) to take immediate action to protect children and teens from JUUL, and continues to work with policymakers to make sure that e-cigarettes are kept out of the hands of children.